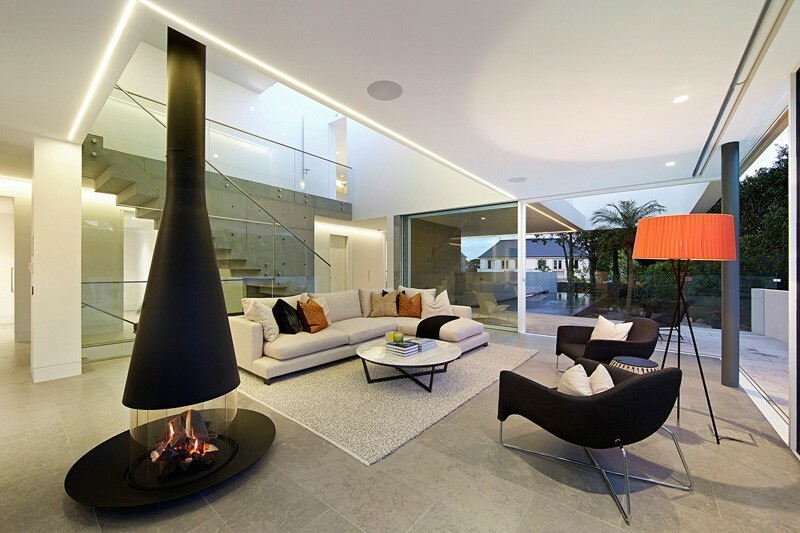 Nothing beats a home which is bright and light creating a cozy and relaxing aura. Aside from the aesthetics which includes colors and style, we also make sure that our home is well-lighted not just in the interior but also in the exterior. We would combine different types of lighting in our homes in order to achieve a bright and appealing space. This way, we could also bring drama into our home. There are many homes that used lighting to make it look really stunning. There are even some that use colorful lighting to bring colors to the dwelling. But as always, never forget natural light to get into your interior because this will not just help you save electricity but it can also make your home warm and refreshing. 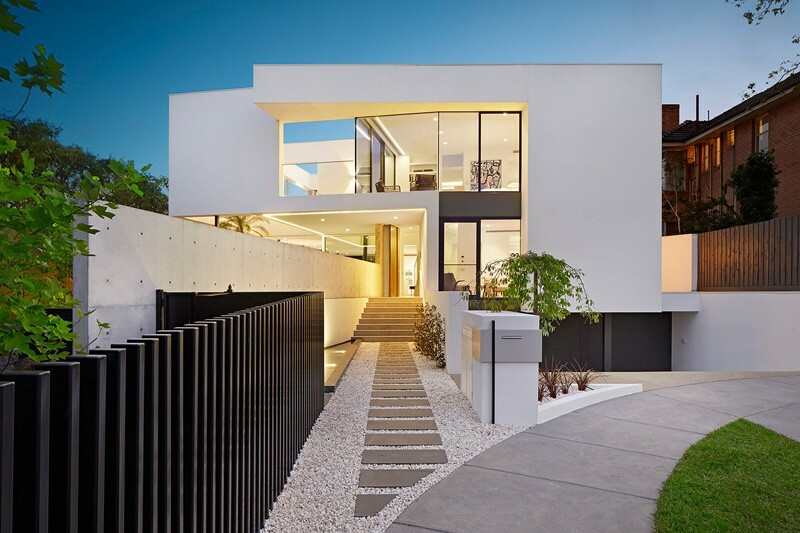 A home in Melbourne, Australia has a stunning architecture and very cozy interior in white. 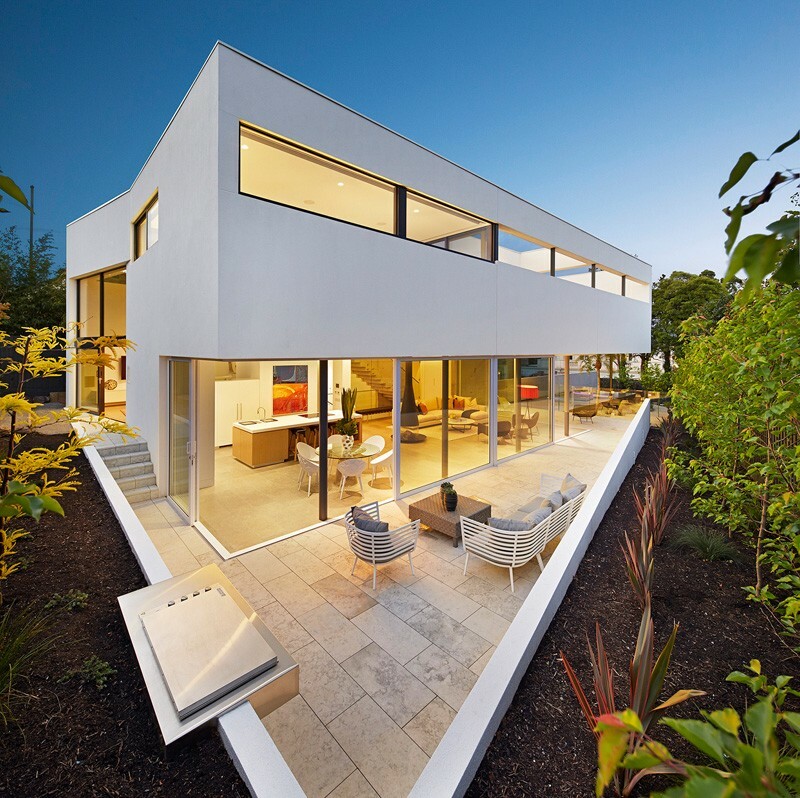 Designed by SVM Studio, the architecture has a sleek appeal with beautifully done lighting. It also played with lines and shapes to achieve a modern look. The outdoor space features a pool area that is surrounded by the home’s simple landscaping. Inside the house, it used white colors and still has that lovely lighting. It used many glass materials from the floor-to-ceiling window to the staircase railing. It also has a nice choice of modern furniture as well. Come take a look at the house below. Unique feature: A modern home with lovely usage of light, huge glass windows for natural light to enter and white colors all over the exterior and interior. 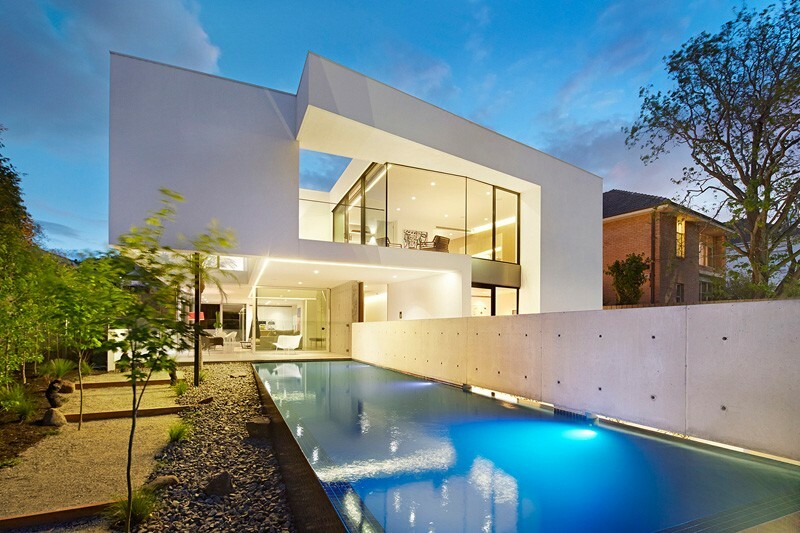 The house features a pool in the outdoors. Along that are stones, bushes and trees. 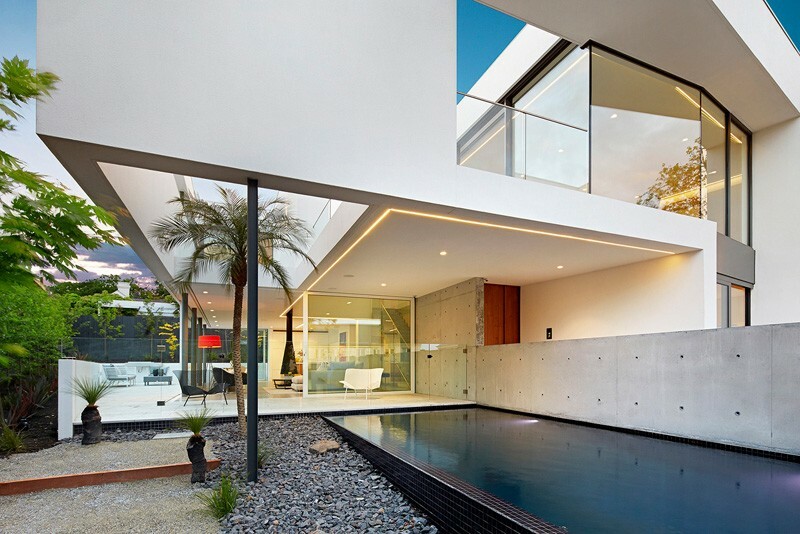 You can also see here the design of the house which used a combination of glass and concrete. The facade of the house is indeed beautiful. Aside from the design of the house itself, I also like what they did to the fence, the plants and the walkways. The overall look isn’t just nice but it is very captivating too. Notice the contrast of colors used in the architecture of the house. It has a well-defined landscaped path which leads directly to the front door. I love the way this path is being designed with concrete steps surrounded by stone. It is also interesting that it added a curved pathway in the front part of the house. For the homeowners, they can spend a lot of time outdoors on this space which has a grill and an outdoor lounge. It would indeed be nice to relax, unwind and enjoy under the blue skies! You can see the pool area once again that use black tiles around it. You can also see here that it has a huge and long concrete wall along it which compliments with the color and look of the pool. Off the living room is this space where one can lounge and relax with a good view of the pool. Of course one can also sit here while taking a break from bathing in the pool. It used glass fence to secure the space. I would guess that there are kids in this house because of this glass fence to make sure that they won’t dive in the pool without supervision. 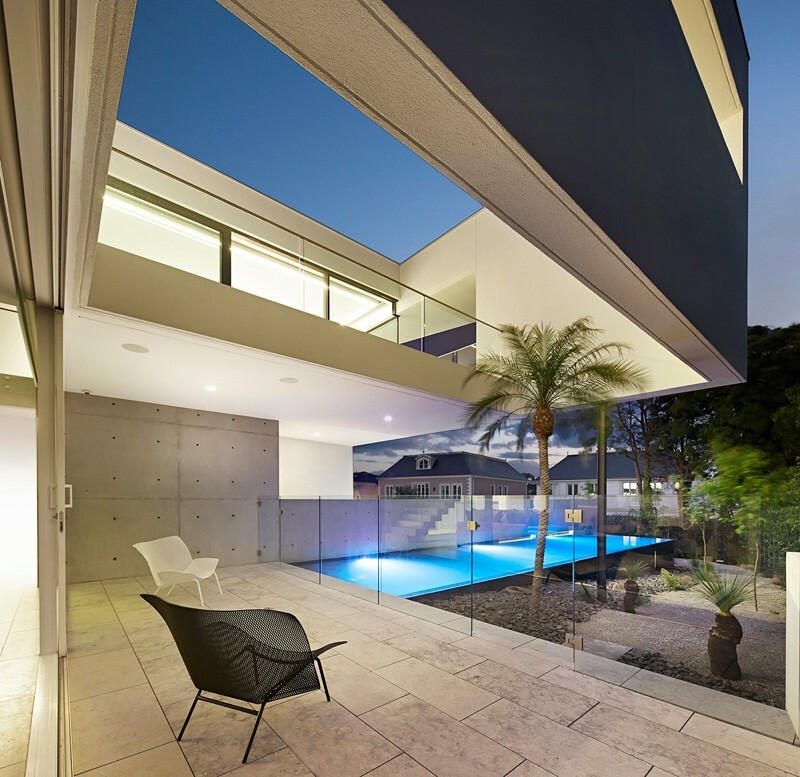 An entire wall glass surrounds the living area which gives it a good view of the space outside including the swimming pool area. You can notice that it has a line of light on the ceiling that is connected to that in the outdoor space. 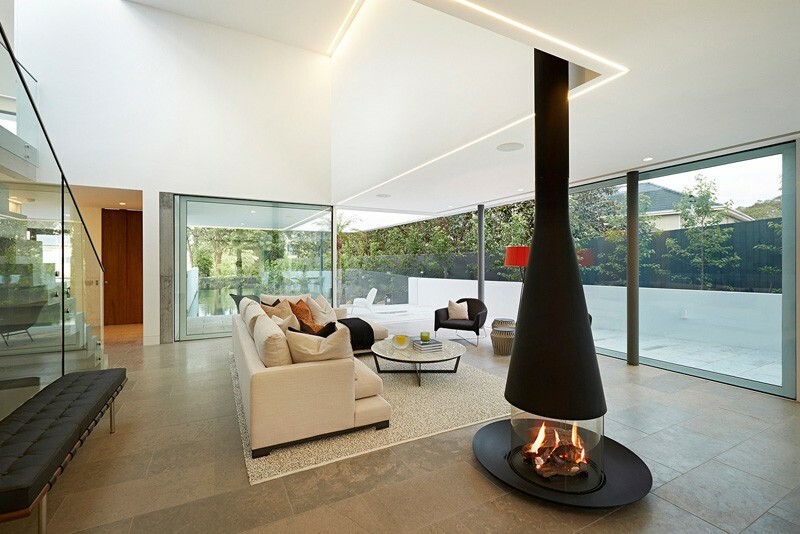 The living area has a stand-alone circular fireplace which separates the living and dining/kitchen area. Notice the contrast of colors in here from the furniture to the walls and ceiling. I find that fireplace really beautiful and it sure is an eye candy! Also, that orange floor lamp would draw your attention as it add a pop of color to the home. The dining area which is located off the kitchen is very open to the outdoors, just like the living space. Yes, the kitchen is only small but it looks very neat and organized. I like the design of the kitchen island wherein the stools can be inserted under it while it has storage for firewood too. Meanwhile, the dining area is also nice with facets on the white chairs that surround a round glass top pedestal table. When I saw this bedroom, what caught my attention at once is that wall decor. I know you saw it at first glance too especially that the space is all white. It also has its own bathroom and a bedroom lounge. Glass walls also surround the area which also opens to a balcony. 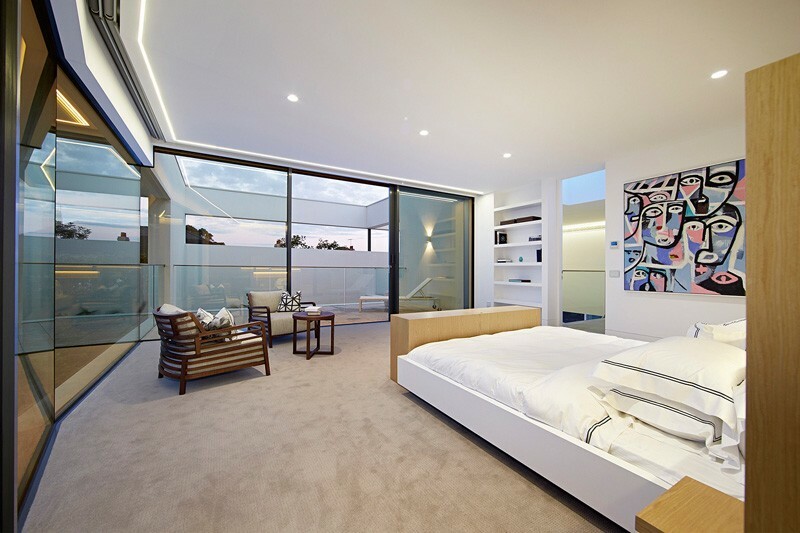 Another bedroom in the house that also leads to the balcony through a sliding glass door. It has a simple design donning clerestory windows for more natural light. And this is the bathroom in the house with a bath tub, wooden cabinets for the white countertop vanity and a glass enclosure for the shower. 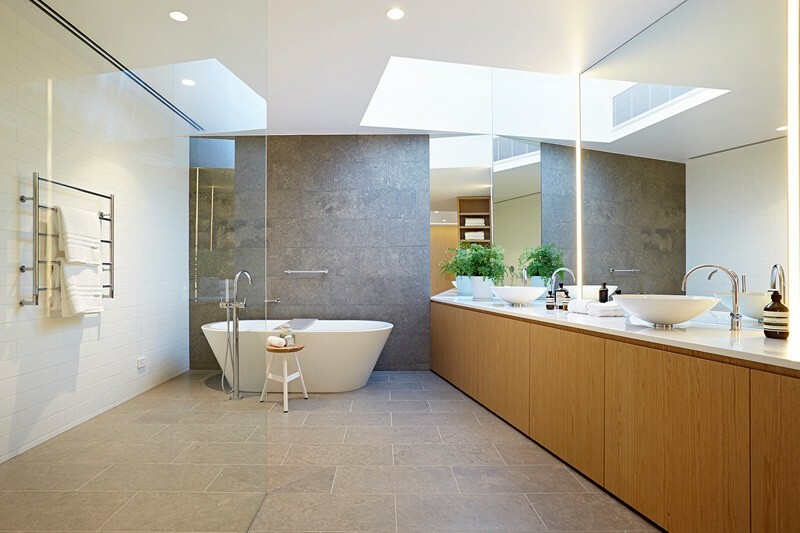 The mix of materials added appeal to this bathroom. This is indeed a stunning home indeed! You can notice all its lovely features as well as the details that made it appear even more beautiful and that made it a comfortable and cozy place to live in. 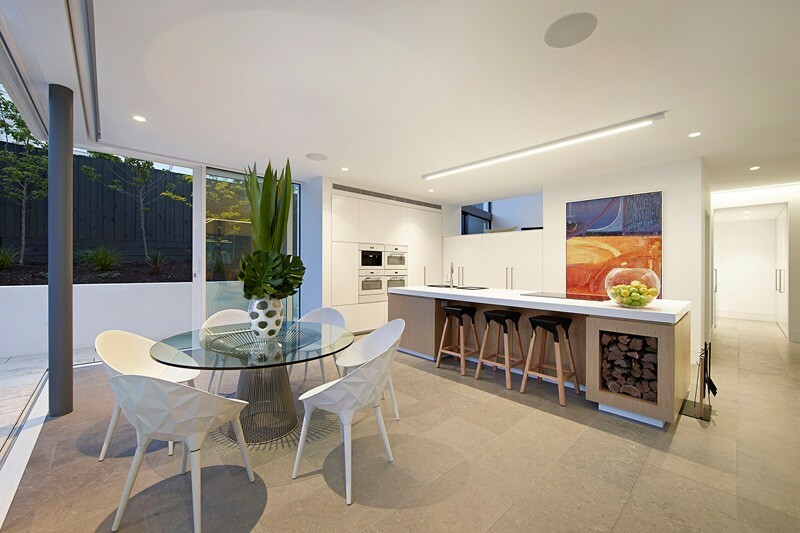 It is also nice that it used white for most of its spaces to give the home a bright and light aura. This gorgeous home is designed by SVM Studio who did an amazing job with everything from layout to home accessories and I know that you will conform with this statement because it is all obvious in the images that we saw above.